Although these innocuous snakes are not poisonous, they can still be undesirable in a yard or garden. 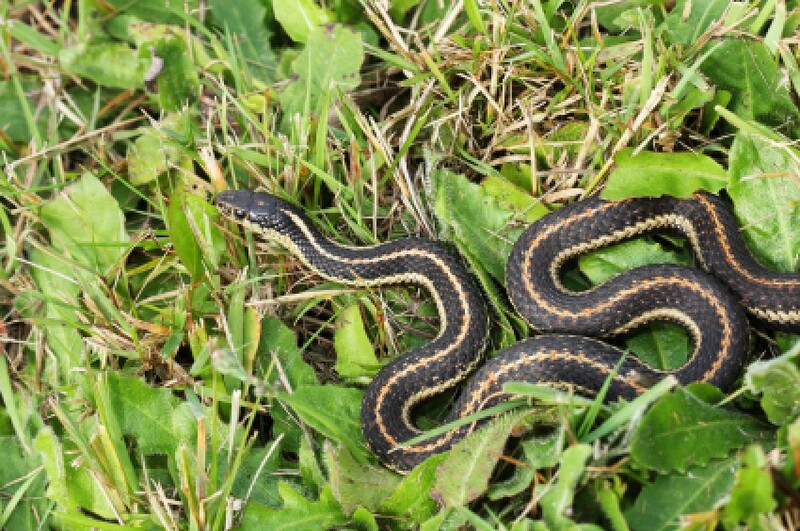 This is a guide about getting rid of garter snakes. To get rid of any snake, use sisal rope. Put it where you don't want the snake. Because of the soft underbelly of the snake, it will not cross over the rope. This is an old cowboy trick handed down by my family. My husband had been plagued by snakes in his shop for about a year now. I finally remembered this and since he has put the rope around doors and places where they come in, he has not had any snakes in his shop. He did average about three a week. Do moth balls or Clorox help keep garter snakes away from the house and yard? I am very very afraid of snakes regardless of what kind and I have a beautiful flowerbed surrounding my home. I used to have many garter snakes hiding in my plants, mating, etc. I put moth balls down in early spring and no more snakes the rest of the summer. It does work. 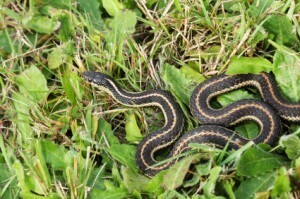 If you want to get rid of garter snakes, get rid of what attracts them such as mice and other pests. Without the snakes you will have more pests in your yard and possibly your house. While Garter Snakes are completely harmless and I personally wouldn't worry about them, snakes dislike cedar. If you mulch your garden with cedar chips, it will repel snakes. I am from the old school of thought that when you had garden (garter) snakes, you did not have mice. I personally prefer the snakes. I do not have either. Snakes love rock gardens, places in the heat yet can be cool. Flower beds made of rock will hold alot. Our other house had plenty until we removed the rock formations from the property, also then the mice moved it. I also use those sticky rodent pads in my garage. I put 2-3 together, depending on what size I find at the store, and they work great. I hate snakes and I'm going to kill everyone I can catch. Also, wasp spray works too. Get the kind that shoots 40 feet and soak them down good. It permeates their skin. I chase them all over my yard until they roll up in a ball. My boyfriend lives on the river and we are having a problem with gardener snakes. We have sealed holes under the sink and everywhere else one would not be okay. Now we are up to 7, I am ready to no longer stay here. Any suggestions? Garter snakes are part of the natural environment, especially near a river, lake, etc. They, too, have a problem-with humans moving into the territory that they have been living in for millions of years before humans. My husband is a biologist and reptile specialist and I am still not fond of snakes, after many years. However, garter snakes are some of the nicest and easiest snakes to live near. They are small and non-venomous, love to eat mice (a plus in my book! ), worms, frogs, etc. They like small holes and cracks for security, which is why you find them in houses. If you live in an older house, there are many holes and cracks for the garters so you will find them occasionally. Please do not hurt them-put them into a box and simply move them outside to a grassy or woodsy area. I hope that you can find a way to live with garter snakes. All you have to do is get few barn cats. I mean outside cats the ones that live outside. We live in Va when we moved in this mobile home we had so much snakes. All kind of snakes even copper head also garden snakes some people say they don't live together that's not true. We also had mice problem. Not anymore we got what I call wild cats. I feed them once a day. But I don't see snakes anymore. I've seen how they catch and eat snakes grous. I had a problem with snakes at our family cabin. My grandparents told me to get a bag of lime and spread it out on the lawn. I have a family of garter snakes living in my concrete patio off my family room. It has cracks in it and that's how they go in and out. They really wouldn't bother me at all if my little dog didn't think of them as toys. If I don't watch him every minute he's outside (which I can't because I need to use a doggy door when I'm out of the house for work), the next thing I know there's a dead (or mostly dead) garter snake or two in my family room. I called someone who deals with things like this and all he said was I should pour bleach into the cracks. That this would either kill them or make them leave the area. So I did what he told me to do. I didn't see any snakes for 2 days, but now they're back! There has to be a better way. Please help. Be very careful with moth balls. If the little dog can get to them in the cracks and eat one, he will die from it. I know from experience! Try sprinkling granulated sulfur in & around the holes & cracks. Farm & ranch supply stores carry the granuated sulfur. I have a problem with garter snakes between my storm door and the door to my house on the lower level. They like to lie there to sun themselves. Also, they have been known to have their young in the crack between the concrete pavement and the cement slab of the basement for the house. It is very annoying. I'd appreciate any input anyone might have as this problem is recurring yearly. Thanks in advance. If you don't have other pets, mothballs or flakes will repel these snakes. Is there something about strawberry plants that garter or garden snakes don't like? I have had problems with snakes in my yard and house, but have never seen one in my strawberry patch which is about 8 ft. x 12 ft. Are there other plants that repel snakes? I don't know of any plants that keep snakes away but we have snakes and the only one I avoid at all cost is the Rattlesnake. The rattlesnake will give you warning to get away from him. The Garter and Garden snakes are harmless and they eat small rodents so if you can share your garden with them they will not hurt you unless you bother them. Remember they are afraid of you as much as you are afraid of them. I have snakes in my basement. I am deathly afraid of snakes. I know they are just garter snakes, but now they have babies. I want to get rid of them, not just repel them, but kill them. I have put down the sticky traps with no results. Do moth balls kill them? Does gravel kill them? Does bleach kill them? I am not able to get around much, I have a heart condition and don't want to end up passed out on the floor in the basement with those creepy crawlers. Any and all suggestions are greatly appreciated. This probably isn't a solution if you only see them once in a while. I live in SD. The kids in our neighborhood like to hunt for snakes. They take them out to the corn field and let them go. The snakes should be in hibernation now, so you probably won't see them anymore till spring. The only way I know of to kill them is to hit them over the head. I don't think you'd want to do that when you are afraid of them. I live in Manitoba, Canada. Here we have garter snakes which are not poisonous. Killing them. I wouldn't cause if the snakes can get into your basement then the mice can also get in. Do you have problems with mice? Probably not cause the snakes are eating them. Then again, garter snakes don't bother me. I was the one that picked them up in the summertime and brought them to the house to show my mom. My brother in law was mentioning that he also had snakes in his basement. His solution...find the hole that they were getting in...by a crumbling wall next to a window and seal it tight. Today I was mowing my lawn and I noticed they were climbing out of my siding into a hole under in the sidewalk! I killed two and my neighbor came and fetched them out, but I seen like 4 more. How do I get rid of em? to rid (RIP) them all at once. i have gardener snakes in my basement, and every now and again they make there way upstairs, what can I do to keep them out of my basement? We have garden snakes. I am so scared of them and have seen so many of them that by now I don't want to be nice anymore and want them killed. We have removed 9 gardener snakes and drove them about 5 miles away and dropped them in a swampy area. One snake had his tail missing, and 2 weeks later, we just caught another gardener snake with his tail missing. Same sized snake as the previous snake removed. With this distance in play, can they find their way back home to our garden area and yard? Thank you for the help.